Large lighting equipment being set up for the Ultra Music Festival fell Thursday night at Miami’s Bayfront Park injuring up to three people. 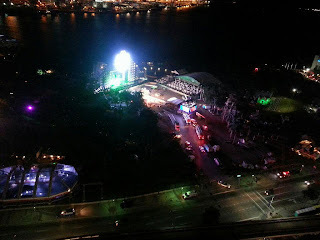 Miami fire rescue workers were at the scene of the accident which occurred at around 8 p.m. during preparations for Friday’s opening of the two-weekend Ultra Festival at the park on Biscayne Boulevard. According to rescue workers, the victims have been transported to Jackson Memorial Hospital’s Ryder Trauma Center. It’s unclear if those injured were workers. Up two people were said to be in critical condition, according to reports on the scene. The accident apparently occurred as stages were being erected. For its 15th year, Ultra, the biggest electronic dance event in the world, had doubled in size from three to six days and spread across two weekend, March 15-17 and March 22-24 in downtown Miami. Among those scheduled to perform are David Guetta, Swedish House Mafia, Deadmau5, Avicii andSnoop Dogg.